Maffew loves to share his knowledge on hair care with others. Bleach is one of the most important products at your disposal for achieving blonde hair, but what happens if you're very sensitive to the product, or you simply don't want to use it? Bleach does have its drawbacks, but luckily, it's not always necessary to use it. If your hair is light enough, it is possible to get blonde hair without bleach. You can use a high lift dye or even regular permanent dye in many circumstances. There are even some natural methods if your hair is light enough. There are a few methods out there if you want to lighten your hair without the use of bleach. Of the available options, high lift dye is the most potent in reaching a blonde hair color. Keep in mind that your hair can't be darker than light brown for these methods to noticeably lighten your hair. Anything darker will certainly require bleach if you want to go blonde. Check out this article for advice on bleaching hair. You can get blonde hair without bleach by using a high lift color. However, your hair does need to meet certain criteria for it to work. If your hair doesn't meet these requirements, the dye will either not work at all or it will not lighten your hair all the way to blonde. No permanent dye should be present in your hair. It can't be darker than light brown. High lift dyes can't lighten darker hair colors to blonde. Unfortunately, bleach is the only option in those cases. For a high lift dye to work, your hair has to be free of any permanent dye. Color doesn't lift color. If you have any permanent hair dye, or even darker temporary colors, you'll have to remove it. You may have to cut your hair and wait for it to grow. Check out this article for a more detailed look on using a high lift dye. The high lift blonde dye you choose needs to be an ash tone. You may not want ash blonde hair, but this will not be the result because of the way the color works. The ash tone is required to neutralize all the orange and yellow pigment that appears as it lightens. If you use a warmer shade, you will end up with orange or yellow hair. You have been warned. Because you need as much lift as possible, and a strong toning effect, you need to choose a salon dye here. Supermarket box dyes won't work because they're neither high lift dyes nor powerful lighteners in general. You can't lighten your hair properly using them unless it is already close to what you want. You need an actual salon brand like Indola or Matrix for dark hair. I would recommend Igora Royal's 0-00 blonding creme for a lift booster designed to be mixed with their high lift dyes. You can add this product to any high lift dye to increase the lightening effect. High lift dye is an effective way to lighten hair that is already dark blonde, or at least light brown. For hair that is darker, you will need to use bleach in order to dye it blonde. Hairdressing is all about using the right product for the right hair in order to end up with a color that looks great and makes you feel good. Here is how you go about applying your high lift dye. Mix your hair color and 40 volume developer in a bowl. Mix them in a ratio of 1:2. Put on gloves and old clothes for protection. Part your hair into four sections. Put up three sections with clips. The loose section is where you will start applying your mixture. Begin applying the mixture to your hair with a dye brush. Use your hands to run the color throughout your hair. Leave the color in your hair for as long as instructed. The average time is usually around 45-60 minutes. Be sure to check your hair color at different intervals. If you get your desired shade early, you can wash the color out. Wash out the color with water until it's gone. Shampoo and condition like you normally do. Whilst high lift dyes are designed to lighten and tone hair simultaneously, the results you achieve may still be brassy. It's the lightening effect that is most important. If your hair turns out brassy, this can be corrected with a toner to finish the color off. Apart from this, your hair care regime after using a high lift dye should be much the same as if you had bleached your hair. Protein treatments, deep conditioning, and leave-in products are all beneficial for your hair after using a high lift dye. What Is Your Favorite Shade of Blonde? 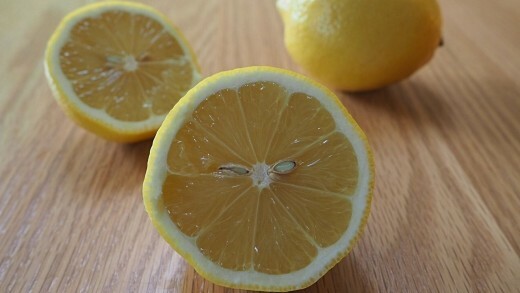 Lemon juice is a great natural method to lighten hair. If your hair is light brown, it could give you the appearance of blonde hair. The citric acid in the juice is a weak oxidizing agent that reduces the melanin in your hair. Get a hold of lemon juice that is freshly squeezed. How much juice depends on how long your hair is and how much you want to lighten. If you have long hair and want to lighten it all, you'll likely need at least two cups. Bottled organic lemon juice works if you can't squeeze any lemons. Mix the lemon juice with water. The ratio should be two parts lemon juice to one part water. Place the mixture in a spray bottle and spray it on your hair. Use a comb to spread it throughout your hair. If you only want to lighten certain spots, section your hair off and spray those parts. You will need heat to activate the lemon juice in your hair. If it is a warm and sunny day, you could go outside for a few hours. The sunlight will work in tandem with the juice to lighten your hair. If the weather outside is not suitable, you can use a blow dryer on the highest setting. Repeat this process as often as necessary. Keep in mind that the acidic lemon juice will dry out your hair with frequent use. Use a deep conditioning treatment to help moisturize your hair. 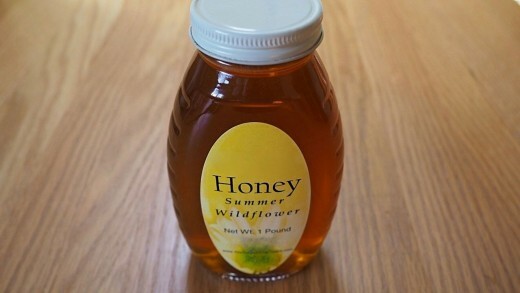 Honey serves as a natural moisturizer and can has a small lightening effect on hair. Lighter hair shades can go blonde with the use of honey. Create a mixture of one cup of raw honey, two cups of distilled vinegar, a tablespoon of olive oil, and a tablespoon of ground cinnamon. Apply the mix to damp hair. You can use a comb to spread the mix throughout your hair. If you only want to apply it to certain sections, separate your hair. Leave the mixture in your hair overnight. Use a shower cap or a plastic wrap. Rinse the mixture out in the morning. This method takes time, so it may take repeated sessions. Chamomile tea has natural chemicals that help lighten hair. Using this substance can lighten your brown hair by two or three shades. Steep five tea bags in two cups of hot water. Allow it to steep until the water cools. 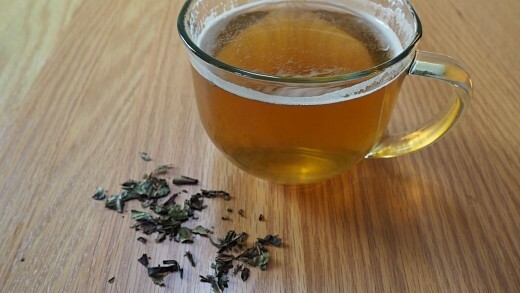 Put the tea into a container and pour it over your damp hair. Alternatively, you can soak your hair into the tea. Allow your hair to dry out. Repeat this process every few days until you get your desired color. Do you need advice to dye your hair blonde? Leave a question in the comments below for tailored advice and share your insight with other readers. What do I do with semi white hair and slate greyhair? If you have a lightish' darkish natural hair color would the blond hair dye still work with out bleaching your hair ??? I recently dyed my hair Carmel blonde that had a reddish tone. I want to get rid of the reddish tone and change it to a lighter shade of blonde. What should I do? HI, I HAVE DARK BROWN HAIR, NOT WITH RED TONE, NOT BLACK THOUGH. I HAVE BEEN TRYING TO GET TO A LIGHT TO MED BROWN, NO HIGHLIGHTS AN LEARNED THE HARD WAY, USING BLONDE CAUSES ORANGE HAIR. IS THERE ANYTHING HIGH LIFT WISE I CAN USE ON DYED HAIR, LIGHT ASH VROWN NICE/EASY GIVES ME DARK BROWN, THAT WILL GIVE ME A LIGHTER BROWN...MID TO LIGHT WITH NO RED. THANK YOU, ALHARA. My hair has turned white on the front of my hair like a three inch band right around from ear to ear. It's. A beautiful color. At a salon they were going to color the back platinum to match my white natural color. My hair turned brassy. What can I do. Btw my natural color from my youth is a dark brown. Help. Thank you, very useful information for those attempting to lighten their hair with professional quality products. I recently stripped out my dark brown dye with color oops. I then used wella 9N with 40 vol hoping to make it a nice shade of blonde. It was brassy so I put on wella t28 toner and left it in for 10 mins. It didn't make much of a difference. Would it be okay if I now used a highlift blonde on my already dyed blonde hair. Will it lift it to the shade I'd like or will it still be brassy? I wanted to use Argan one and only in shade highlift cool blonde. Thanks for any help, I'm nervous. My hair is normally a medium brown, I recently highlighted my hair a carmel brown which I love, due to having so much grey. My roots are very grey now. I usually do the touch up in between salon visits but I'm wondering since my hair is so grey can I color my roots a dark blond without bleaching or using a high lift dye? I usually schwartskoff 7-0 & 7-4, but I want to go to an 8. Is that possible without bleach? Hi there! I need to dye my orange hair again but noticed last time that my highlights were getting damaged. How can I highlight again with out going over highlights?? I've used Sun-In, will that effect how well a high lift dye will work? How do you dye your hair? 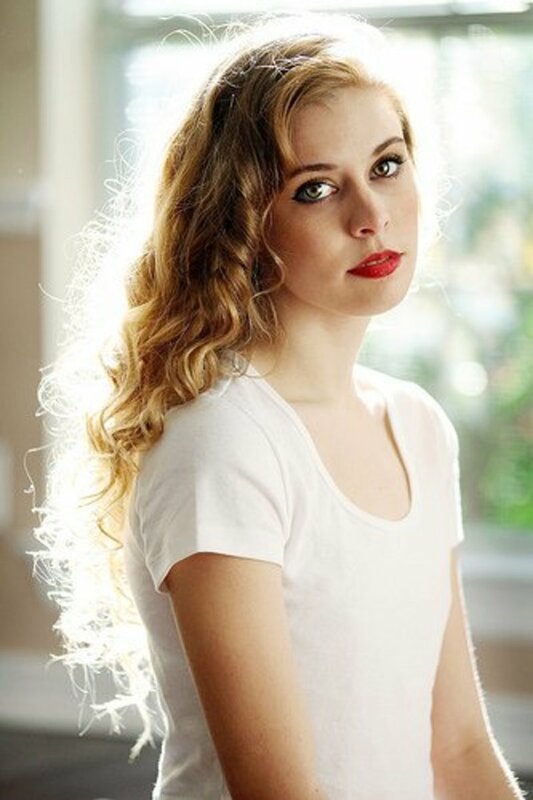 hey, my hair is naturally auburn, would i still be able to die it blonde in this way? My hair is ashy light brown, my biggest fear doing this is getting my hair golden blond which would be terrible on me. How big is the risk of getting my hair golden and how to reduce risk of it happening? Can you use a bleach cap (or a series of bleach caps) to strip any remaining color, and gradually lighten my hair, then go in with a highlift color? How can I achieve ash blonde without using bleach in my hair color now? I was wondering how a dish water blonde could achive a white blonde color once they have coloured their hair ultra lite blonde. It turned orange. Do you need bleach to clour grey hair blonde? After reading this article I have a few questions, I know you said you can dye the hair with Matrix SoColor UL-AA or other brands right ? I dyed my hair blond and it came out very light brown but brassy, because I have very dark black asian hair..and I never wanted to bleach it on my own. So can I still use high lift to correct it lighter or should I try purple shampoo?! Please help! I dyed my hair medium burgundy and used high lift but it just didn't make my hair blonde just made the color lighter what should I do lighten it? Great article! So my hair has been over processed and damaged with bleach. I don't want to lose my blond - roots are already 4 months long and I'm starting to get restless waiting for the virgin hair to grow out. My question is: could I use a high lift tint on the roots only and kind of merge it in? Or would it be a disaster if any of it hit the top of the bleached parts? Thanks in advance! Is it safe to think that using blonde dye on black hair without using bleach or high lift, would produce the color light brown? I mean if that's what I want. I dyed my hair black seven months ago and now I want light blonde. Will I get the perfect light blonde at the first dye? I don't want to use bleach. please help.... I have curly mousy blonde hair with lots of grey in the middle. I have relocated to another country and want to do my own hair at home. I find that my hair goes orange when I have been to an hair salon. Please give me step by step instructions on what to purchase in order to get a nice natural blonde look. I bleached my hair and dyed it burgundy. I want to go back to blonde. Will the burgundy prevent me from going blonde? I've had violet peekaboos put in and now that it's dyed out to a pinky whitish color I want to go with a medium blonde peekaboo. Do I just use the box dye over the old color or do I need to bleach it first? I am a first timer doing this on my own. Can i put a high lift dye over ALREADY highlighted hair (that has been bleached with 40 Vol./Loreal Quick Blue powder bleach)?? I had my hair dark brown but had res in it from my previous colour before my dark hair. I want to go blonde, I had my hair stripped then bleached or high lifted. Could I go blonde in the same day or would I have to do it in stages? As I and my family thought I would come home blonde but I'm a copper colour ? I've never dyed my gingery, orange, red hair before. I love my hair color but I'm looking for a change in the form of a very light pastel purple. 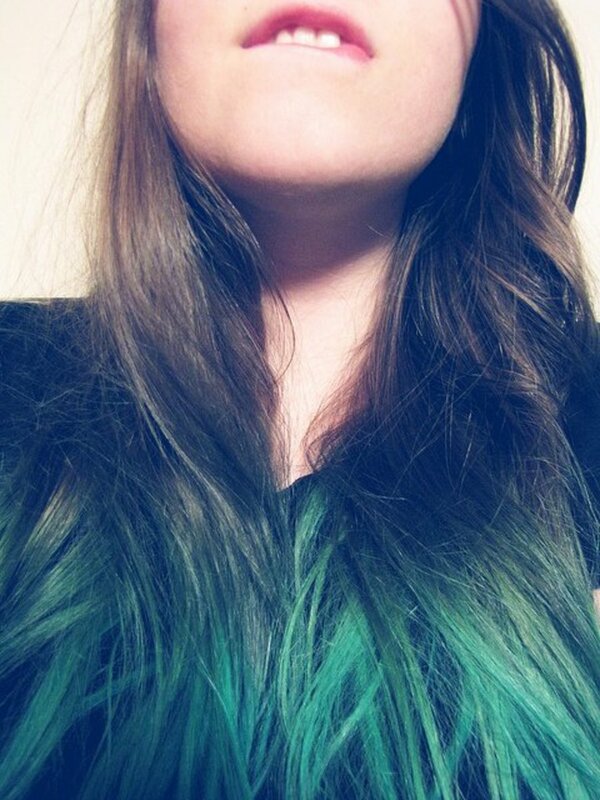 However, I was wondering if I could do this without bleaching and with a semi permanent dye? I have no idea if this exists but I would love to know if it does. I just want to make sure that my natural hair color is not permanently changed. How can I achive level 6 to level 11 with high lift. I always use 10.01(wella, Fuge, or Matrix) with 9% but always comes out yellow or gingery and on there is try to use tone T01 from Fuge but doesn't really work. What can I do any advice please? Okay, quick question. Everytime i bleach my hair, there are orange spots that come with it. if i use the color lift will it still make that orange tone? I am a natural blonde but have dyed my hair several times & i just want my natura hair color back! I have dark brown almost black hair. I did the mistake of only using a hi lift shade UL-PA socolor from matrix thinking i would get ashy hair. Boy was i wrong and i wish i had seen this before! Well my hair is now light orange!!! Please help me what can i do now? I didnt use bleach only the hi lift. I really hope you get back to me. I use Socolor HDRV And have been for about 6 yrs . I have I short asymmetrical cut but I have the hardest time getting blonde highlights when I try during the summer months. I know it's bc I use so much red. But I use Wella/40 vol wen I try & suggestions ? Hi, I'm a light blonde. My hair when I was little was naturally almost white. I want my hair to be a few tones lighter, but I don't want to damage my hair in the process. Help! I bleached my hair twice over two weeks then used a toner. Right now it's like a honey blonde maybe a little darker in spots (with some orange/brassy). I want to know if I can tone it again or if I should use a semi permanent hair dye like wella. I'm going for a really light blonde. Overall my hair is pretty healthy, except for a few spots that get stretchy when wet but I figured I could leave those out. Bleach is much more effective on dyed hair because dye struggles to lift artificial pigment. In this sense, a high lift dye won't make much of a difference to the level, but you'll still suffer all the damage from the dye because the damage is a side effect of the way the product works. Even if little lift occurs, you still get the same amount of damage as if more significant lightening had been achieved. The best thing to do at this point would be to tone temporarily using a semi-permanent dye in 7A to get your hair to look a nice medium blonde, and then really focus on protein treatments and giving your hair the time it needs to recover strength before you go any further. Eventually if it is strong enough, you may be able to bleach with a low volume of developer or as a bleach wash to take it a little further, very carefully, but only if the condition improves. Of course, im paying for it dearly, rather my hair is paying. It's damaged. Ive been babying it. Protein treatments and deep conditions every other night. It is currently at the gold level and I need to lift at least 2 more levels. I was advised by a rep at Sallys to use the hilift dye by loreal. Ash blonde. Will that dye get me the next two levels of lift? I can't bleach again. I've bleached 3 times in a week and my hair is holding on, but hates me. I need to be as close to platinum as possible with the least amount of damage...pleeeaaassseee help?? I've light brown hair and I havent dyed it before. I really want to get my hair platinum blonde but without using bleach or causing any damage to my hair. I literally have no experience and know nothing about hair dyes. Please help me to get my hair platinum blonde at home and without much damage. I've read the page but I didn't really get everything. Okay so I am a natural Strawberry blonde and I died my hair red and it faded fairly quickly. It was box dye, i just wanted to try it. Then about 5 months later I went from like a pink to black with box dye but now my blonde roots are back and its now an auburn brown color with this work if I wanna go back to blonde? I apologise for the lateness of my reply. The amount of lightening you get is largely determined by whether you've dyed it before, what shades you've used, and how many times it was dyed; as well as how dark it is. The short answer is that at a reddish orange colour, your hair is probably about a level 4 - 5, and high lift can take this to a darker shade of blonde (No platinum or light shades are likely though as it's not usually strong enough for that when used on hair this dark). Whether it can do this will depend on what has been done to your hair in the past though. If you've applied any dark colours like brown shades (Light, medium, or dark brown), or black, this will reduce the lift of a high lift dye because every dye you apply to your hair adds artificial colour that can not be removed very well by use of another dye. You can still see lightening because any natural pigment in your hair will still lift, but this lift is often minimal if there is a lot of dye pigment present. To sum everything up, if you've dyed it with darker colours, or you've dyed it a few times, bleach will be more reliable and the better option for lightening it. Otherwise, feel free to use a high lift but keep in mind that you may need to tone separately with another dye afterwards. The high lift can lighten your darker hair, but it won't tone properly in this situation because the dye pigment isn't strong enough to cover the darker warmth. My hair is a reddish orange color, would I be able to use a high lift on my hair? Gloss shouldn't lighten, but if it was a demi-permanent of permanent gloss, this will be mixed with developer, which can produce lightening, although it's not the intended effect with a gloss. If a high volume of developer was used, this will lighten more drastically without any colour deposit because the gloss contains almost no pigment. It's also possible the product used was a lightener though. 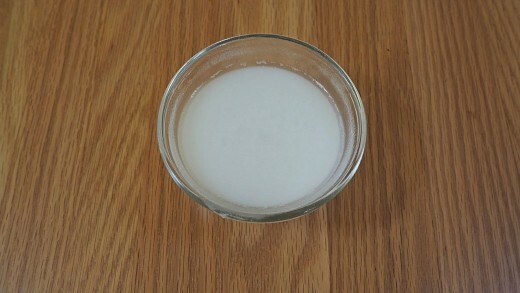 Lightening extract, for example, is mixed into other shades in some brands to increase lift, or can be used by itself like bleach. It's basically the same thing as a blonde dye, except without the actual colour pigment and more ammonia, so it could be used as a lightening gloss. I have a question. About a year ago I wanted to take my very dark brown (dyed from mix of gray and medium brown). My colorist started to apply a "clear gloss/glaze" after doing my root touch up each time. I have it touched up every three weeks. I am now blonde. No bleach was used. I don't have virgin hair so,why did this work and what's in it? Is there a developer in the gloss? With all that dye buildup, it's very very unlikely you'll see any lightening from the use of another dye. You could use dye remover to try and strip it out, but I wouldn't recommend this either because of how long you've been dyeing it. Any dye that is stripped out will be patchy and you won't get it to blonde this way. Overall, the best way to get to blonde will be to bleach it to slightly lighter than the level of blonde you want and then tone. 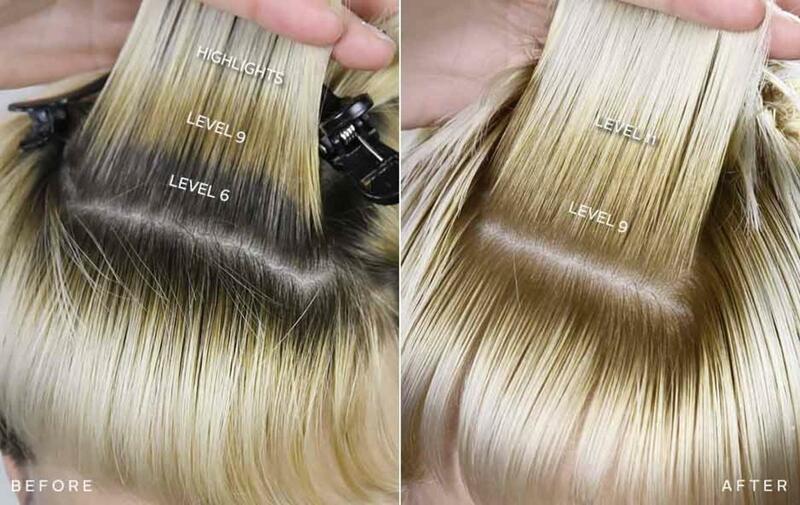 For a light blonde at level 8 for example, this would mean bleaching to lighter than level 8 before toning. The reason for this is because toning will darken your hair slightly as colour is added to neutralise the colour you don't want to be visible. The colour you use to tone will depend on what warm tones are present: If there's still a lot of red tone, use green ash mixed into a natural shade. If it's more of an orange colour, use blue-based ash. If it looks yellow, which isn't likely with all that red dye present; use violet. Eg, if your hair looked bright reddish orange after bleaching and you were using Wella Koleston, this could be toned to blonde using a combination of natural blonde (/0 shades), and matte blonde (/2 green based ash). How this all turns out is dependent on the bleaching, and the more evenly you can apply bleach, the better it will lighten, and the less likely it will end up patchy. After that, there are ways to even out hair that does end up patchy from bleaching without having to dye it substantially darker. If you're happy with the lift and it's just that warmth developing over time that worries you, the best option is to tone in-between dyeing. This will keep your colour cooler for longer, but without causing additional damage. Indola P.1 or P.01 are good options for this if you're staying with the Indola brand. Alternatively, a good violet shampoo may be all you need. You can wash your hair with a product like Fudge Violet Shampoo either every time you wash it, a few times a week, or intermittently with your regular shampoo to maintain a cooler shade and eliminate yellow and gold tones from your hair. I like to recommend the Fudge Violet because it's concentrated and reliable, but it's perfectly fine to use other brands; just make sure that the shampoo you use is strong enough to effectively tone your hair. The darker your hair is, or the ashier you want it to be, the stronger the shampoo needs to be to affect the colour. Vice versa, when maintaining lighter blonde hair that is showing yellow or gold tones, you may want to use a weaker shampoo or dilute it down with a white shampoo so that your hair doesn't over-tone or become too ashy. I've been using the indola 1000.1 for many years, & getting foils in my hair every few months to counteract the gold, but still find my hair gold in between foils, I was thinking of using the igora with a high lift as I like the level of light I'm getting just want more of a ash blonde, what your recommendation. With long hair like yours, the biggest problem can be unevenness, so the quicker and more consistently you apply dye, the better the results are going to be. Damage shouldn't be a major problem because your hair is already close to blonde and you won't need to lighten it too much. 1. High lift blonde dye, such as the Wella Koleston 12/ dyes. This kind of dye is permanent dye that has a higher ammonia content and is mixed with 40 vol developer to push as much lightening as possible without using bleach powder. It won't work as effectively on hair that has already been dyed, especially if your hair has been dyed darker colours like brown shades in the past. To use this method, you will need high lift dye in an ash shade, eg, Wella Koleston 12/1 or whatever brand you prefer, mix that with 40 vol as the developer, apply to lengths about an inch away from your scalp (To avoid hot roots from the increased lightening here), and process for about 10 minutes or so. After that, apply to the root area and process until it has lightened as far as you want it to lighten, or the maximum processing time has been reached. Using high lift dye, the ash tone present is going to help counteract the warmth while it lightens, but you may still have to tone separately afterwards if it still looks too brassy. Bleach is more reliable but slightly more damaging than dye. To do it this way, mix bleach powder with 20 vol developer and apply lengths first for 10 minutes, then to roots and continue processing. Lighten to a gold-orange for dark blonde (Mostly gold with a tinge of orange), to gold for medium blonde, to yellow for light blonde, to light yellow for very light blonde, or to pale yellow for platinum. Following this, use an ash tone dye one level lighter than the level you bleached to for toning. For example, if you bleached to gold for a medium blonde result, tone with light ash blonde. After application, remove the dye when you're happy with the colour. For a very cool or very ashy result, tone for longer or apply ash at the same level as the colour you want. Ideally, for the most natural looking colour, you may want to stick to shades that are light, medium, or dark blonde overall as very light shades don't look as natural unless you have pale skin. As for the tone you aim for, match that to your skin tone and it will look more natural. IE, if you have a warm skin tone, choose darker shades and go for beige or golden blonde. If you have cooler skin, go for neutral or ash. Let me know if you need any further clarification, and good luck with your colour! I've previously died my hair once or twice with the ion color dyes, and have used those hair lighteners you get at the store (I live in Switzerland and I don't know if they had bleach or not I think they were high lift dye). They worked on my hair but only lifted it 1-2 shades lighter not to mention I got highlights (very small ones) last December. My hair is a natural light brown but gets lighter at the ends for some reason (naturally I don't know why). And I would like to go to a natural blonde. My hair is very long (about to the end of my ribs) and in healthy condition. I really want to keep the length. 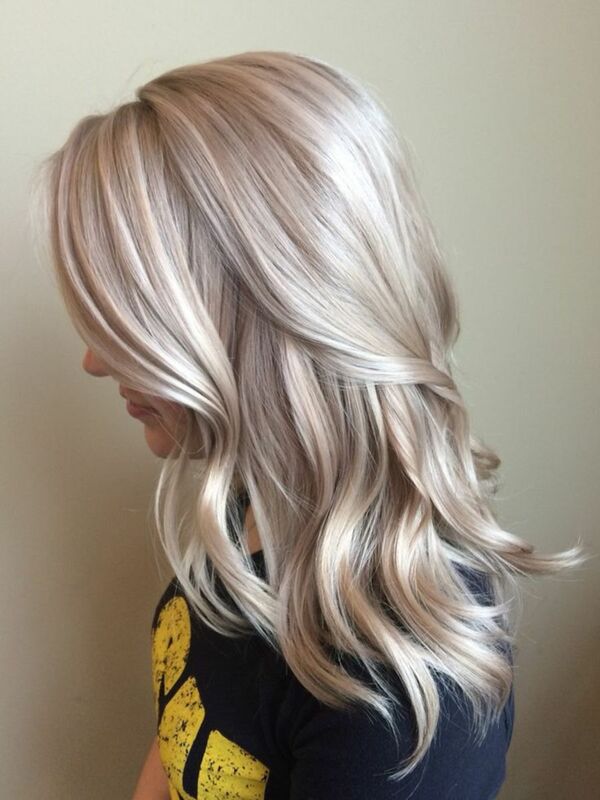 Do you have any tips how I could go to this shade of blonde a healthy way with a good natural-looking out come? Thanks! Lightening potential decreases with the more times your hair has been dyed, so another dye is going to have less of an effect. In the case of darker dye, this can prevent any lightening at all, but if you've only used that high lift, you'll likely be able to take it a little further with another dye, but do keep in mind that it may not lift as well as you hope. To do this, either use another high lift if your hair is in good condition, or a blonde dye at level 9 or 10 with 30 or 40 vol as the developer. The regular blonde dye is less damaging, even when using 40 vol as the developer, but it will produce less lightening. You can use an ash tone to help deal with any yellow tones that are showing, but it tends to be easier to focus on lightening and tone separately if there is any warmth that needs to be neutralised. Follow the high lift or blonde dye up with a demi-permanent ash dye as the toner if you need additional toning after lightening. Hello. I applied a high lift blonde to my hair and it's still not as light as I want it. I am a natural dirty blonde but want to be more platinum. I want to avoid bleach at all cost as my hair is very fine. Could I re apply the high lift blonde again to get to that platinum stage? What would you recommend? It's only a few stages darker than what Im wanting. I want really white. I also have some gold in it that I want to go. What should I do? Good luck with your colour Sara, and let me know if you have any problems with it. Bleach can be powder, paste, or oil based, but powder is most common and most effective. It's a combination of oxidants, which lighten your hair, with conditioning agents and other caring ingredients to help offset any damage. Developer, which is hydrogen peroxide, is added to both dye and bleach. Used in dye, the ammonia in the dye opens the hair cuticle and allows the mixture to penetrate; peroxide then develops the colour as well as lightens natural pigment. Used in bleach, it has a similar effect but the lightening is supported by other oxidants which have a much stronger effect. Dye can only be made so strong, at which point bleach is more effective if you need better lightening. As for those brands, with Goldwell you can use Oxycur Platin or Silk Lift. With Matrix you can use V-Light, Light Master, or Logics. Regardless of what you're using it needs to be mixed with developer and I'd recommend going no higher than 20 vol for this. You don't need a super strong formula to get it the rest of the way to blonde. Apply that to your roots only and lift until it's just slightly lighter than your lengths. You need it to be slightly lighter because toning will darken it slightly. This way it matches the lengths much more accurately after toning. To tone it, use an ash blonde dye that is one level lighter for soft ash or warmer results, or use an ash blonde dye at the level of your hair for a more intense cool ash result. 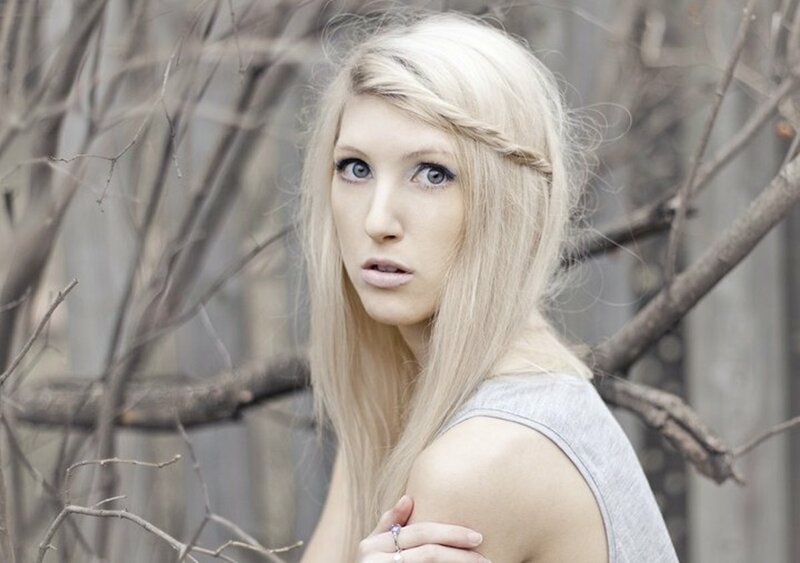 Eg, if your lengths are light blonde (Level 8), use very light ash blonde dye (9A), to tone your roots. If you want a more intense ash, tone with 8A instead in this example. As with the bleaching, apply this dye to your roots only and allow this to process until it matches your lengths closely, and then apply all over for the last few minutes to get a more even result. For touching up roots as they grow in, apply bleach to roots only, and then do the same thing for toning. As it grows out you won't be overlapping it every time you retouch because you're keeping it to the roots. The lengths just require occasional toning with a temporary toner if they start to look too brassy. I cannot thank you enough for the excellent direction you provided. I do have a follow up question...when you state to apply bleach with 20 volume developer what is considered bleach? I am looking at goldwell and matrix products and so confused! Have not done this in years so please excuse my lack of knowledge and memory here :-)Also, once I successfully achieve the blonde color I desire, should I be mixing ash and ultra blonde color dye with the developer or is this a 2 step process? Lastly, would I just touch up roots as needed? I want to keep the integrity of my hair as much as possible! The dark brown is much too dark to be lightened effectively with a high lift. It's best to use them on lighter hair for a blonde result, or you can use them as you did for a lighter brown from darker hair. As for correcting it, toning will neutralise the orange, which will take it to about a light brown colour. Whilst this gets rid of the unwanted orange tone, it does nothing for the fact that the colour is still much too dark to match. At this point, the best way to fix the roots now that they've been dyed already is to apply bleach with 20 vol as the developer, lighten to slightly lighter than your lengths, and then tone with the appropriate ash blonde toner to finish it off. Onto your other questions: you should definitely lighten the roots the rest of the way before you apply any more dye to them. The more dye you apply, the less effective anything you use to lighten it will be afterward. As for mixing Goldwell developer with Matrix dyes, that's perfectly fine. All developer is just hydrogen peroxide in the end. Each brand tends to formulate their own developer in a way that it is the perfect consistency to mix in with their own dyes, but it will still work fine with a different brand. Just don't mix two dyes from different brands; that's a different case altogether. I attempted to dye my dark brown roots and already lightened hair (had some low lights in it from the winter) with goldwell 12 BN and 40 volume developer. Roots came out orange however rest of hair lightened nicely. How can I correct it and should I just get a toner for the roots? I used to use Matrix and mixed an ultra light blonde with an ash blonde but forget the mixture. I also thought they had a toner I may be able to use on my roots. I have to put baby powder or dry shampoo on my orange roots for now ;-( also, how long should I wait between coloring and should I only dye to roots once the orange is corrected? Also, can I mix a 40 volume goldwell developer with a matrix color? Or would I have to purchase a goldwell color? Thank you in advance for your help. I just want a nice light blonde without brass or orange! Definitely try Wella Koleston 12/11, Igora Royal 12-11, Indola 1000.11, or Matrix UL-AA. Mixed with 40 vol developer, you should be able to get close to platinum on a level 6 or lighter base with any of these. Of Course, this all depends on what you can actually get. This isn't too unusual to see. When you apply blue on top of hair that contains too much yellow or gold tone, it looks blue to begin with as the dye is still intense. As it fades with washing though, the amount of blue tone in your hair decreases and the remaining blue blends with the yellow in your hair to look green. As for getting orange or yellow out of your hair, you need to use ash dye to add the correct complementary tone into your hair to cancel out the appearance of the colour you don't want. It's the same sort of process that's happening with the blue and yellow, except when two complementary colours mix, they actually form a neutral result. In this case, the complementary tone for yellow is violet, and blue is the complementary tone for orange. You'll get the best toning results if you use an ash blonde dye that is violet-blue based. I'd advise against using a high lift for this purpose as they are an alternative to bleach, but they're not gentle. They do cause less damage, but they're still more damaging than a regular dye. If you only want 1 - 3 levels of lift I'd recommend using a regular dye. Going on the fact that you like the dark gold colour from the sun-streaking, would you like a dark golden blonde result, or something lighter than that? Howdy- I took a medication (a PPI) that wound up having the unexpected unwanted side effect of both hair loss and weakening. After more than a year off of both the meda and all hair treatments (last of old highlights cut off) I've got all-virgin light brown hair that is kind of mousey but in sunlight has a lot of red and gold. To avoid any more weakening I'd like to try the high lift but seriously want to avoid 1) brassy and 2) red (red on me is awful). My natural tendency (when I'm lucky enough to spend time at the beach) is to lighten in streaks- I turn a natural dark gold and that's what I'd like to try for. I want to avoid yellow and don't want to go more than a few shades lighter Can you suggest a good lift that will avoid the red/orange/brass and a post-lift toner should the lift leave me too brassy? Thanks up front! The best option is to bleach the darker hair to even it out and then tone as intended. You should only need to apply the bleach for about 20 minutes at this point to get that hair to the same level. The reason a high lift isn't the best option in this case is because you've used dye to tone it. There's no guarantee that it would lift with the artificial colour in your hair now. It's also overkill for the results you want to achieve. High lift dye contains a lot of ammonia and is mixed with 40 vol developer. For the small amount of lightening that's left to be accomplished you'll actually get less damage using bleach. So I went to a salon and got my ends bleached because I wanted ombré and it turned out a nice yellowish blonde and then they used a toner on me that made it a light blonde. I went back the best week and got the rest of my hair bleached because I didn't want the ombré anymore and the top of my hair turned out that yellowy blonde , the bottom wasn't bleached because it was already at my desired color, and the rest of my hair turned out orangeish. I waited about a week with orange hair and then I tried to use a toner with a blue and purple base to get rid of the Orange and pale yellow tones . It took out the yellow, but not the Orange . I wanted to know f I could use this lifting dye on just the Orange parts to get them to that pale yellow color so that I can re tone my hair again to get to my desired color ? Would that work??? I've never used UL-A+. It appears to be equivalent to UL-A. The disparate shades could be a matter of location. Wella tends to do this kind of thing too where they release slightly different shades in different countries. If in doubt, go with your hairdresser's recommendation once they see your hair and know what they're working with. It can always be toned separately if the ash high lift used isn't strong enough. As for the regrowth, I'd recommend trying Igora's Expert Mousses in either 9.5-1 or 8-1. You can use these as often as necessary as they are semi-permanent and don't damage the hair. 9.5-1 is pastel ash while 8-1 is a light ash blonde - use whichever is strong enough to effectively give you enough cool tone to keep it looking the way you want. You could also use a good blonde shampoo like Fudge Violet and that's often enough to never need toning at all. Thanks so much for your advice. Yes the Matrix colour gives me a lovely blonde. I have since found another hairdresser who uses Matrix so I have cancelled the other appointment and will go with the colour I know. I'm not sure if my previous colourist used a ULA or UL-AA. She wrote it down as ULA+. Could you please advise how much ash the UL-AA would throw opposed to the regular ULA? I do have a problem with my hair getting more gold about 3 weeks after the colour and when the regrowth starts to appear. What level did the Matrix lift to? Did it actually take you to a blonde colour, or were you using it to achieve a lighter brown? In any case, Indola is an excellent brand and their high lifts offer great lightening. The lift is about the same as both Matrix and Igora when using 40 vol. The pearl high lift is a different colour to Matrix's ash tone however. Indola 1000.22 pearl blonde has a base that is mostly violet with some blue tone, whilst Matrix UL-A is a heavier blue-violet. You won't get the exact same shade using it and it likely will lead to some brassiness because it's not as strong in tone. It'd be better to use Indola 1000.1 for this purpose to replace Matrix UL-A as the two are a more similar base tone and colour result. Matrix also has a UL-AA which is a stronger ash though, so be aware if you were using that one, you should substitute with Indola 1000.11 instead for the most similar colour. I've moved state and finding it difficult to get the same hair colour. I have dark brown hair and I used to have the matrix high lift tint in and Ultra light Ash + 40 vol. Personally I found this to be a great colour as there was never any brassiness . The hairdresser in my new area uses the Indola colour in a Pearl blonde and I was advised that the results with that brand are better. Would like to know if the Indola brand is really better as I've previously had problems with brassiness and would like to avoid this at all costs..
Thinner hair is more prone to noticeable damage because there's less of it. Normally, thicker hair that is somewhat damaged won't show it so noticeably because if you end up with split ends or breakage, it's a much smaller fraction of your hair. Less hair means damage is more visible. As for the coconut masque, conditioning agents like this will help keep your hair from drying out too much during bleaching and thus reduce damage, but not by much. Protein treatments are a better way to actually reverse damage as they repair the protein that your hair is made out of. Conditioners can't do this; they can only alleviate dryness and make your hair feel softer and nicer. This is a great article! I shaved my head back in September, and now its in a pixie stage. I wanted to bleach it again to platinum, but recently I got a hair cut to shape it a bit, and she used thinning shears, and I was wondering if bleaching it will make those ends more prone to damage?? I have bleached it before, but I am so impatient that I do it all at once and end up with really damage hair. This time, because my hair is so short, I will take my time in order to get it platinum and not have to shave my head again! Also, is it true that making a hair masque with coconut oil will help protect the hair while bleaching it?? You're using the right shade and the right volume of developer. Given that it's only part of your hair that isn't lightening properly, I think that's probably key to solving the problem. Are these areas applied to last, or perhaps less product is applied there? If that's the case, you can always try getting someone to help you apply the dye so that it is applied to all your hair much more quickly and see if that helps produce a more even colour. Or if possible, you could rinse those areas out last. If that still doesn't help, it's possible those sections of hair are naturally more resistant to lightening. You might want to try using a stronger high lift like the ones available in the Igora Royal or Wella Koleston brands to increase the likelihood it lifts properly. Natural blonde, one level lighter than what your hair is. This would mean that if you lightened your hair to a level 8 yellow colour, you would tone with a 9N for a golden result. If it was a level 7 though, you would be using an 8N for toning. Lighten to the level that you want and tone like this. For the toner, permanent is superior to a semi because it will last significantly longer and produce a more natural result. I'd recommend a brand like Wella Koleston or Igora Royal, but most brands will work. Only develop until it is the desired shade. Leaving on for longer will move towards more of a neutral and then ashy tone. As for the bleach bath; probably not a good idea. A bleach bath is best for stripping out dye, subtle lightening, or correcting hair colour. It lifts quick and effectively, but it doesn't lift much. It won't usually be able to take dark brown hair to blonde and isn't the best way to do it. A regular bleaching is more reliable and effective for this. Thank you so much for responding. So to make sure I'm understanding this because my hair is dark brown, i need to leave the bleach in until it turns to the yfellow color. When finished I need to apply a toner 1 level lighter than my hair to achieve the golden blonde look? Oh and how do you feel about a bleach bath? And what toner would you recommend for me, permanent or semi permanent preferably, that I can purchase from somewhere like sally beauty shop. When lightening your hair, warmth is inevitable. Underneath the colour you see, there is a rich warm base tone which gives your colour its depth. In dark hair, this is a copper to deep red colour. It's only once your hair is bleached that the cool tones are lifted out first and you start to see this warm base tone. To dye it blonde, you'll need to reach the yellow stage, where copper tones are no longer present and your hair is predominantly golden. After this, cool tone is added back into your hair to neutralise some of that unwanted warmth and give you the colour you actually want. For a golden blonde shade, you wouldn't be neutralising too much gold, but you do need to soften it a little or the colour looks unnatural. As for your own hair, given how dark it is, you'll need to use bleach to lift your roots light enough. As you left a comment on my how to bleach hair article, you would have read about how to apply and use it. If you look at the base tones chart in that article, you will be able to see what your hair will look like at each level as it lightens. To tone it after you've bleached it, match the colour to the yellow on that chart to see what level it is. Once you know that, use a natural tone, one level lighter than your current level. This will neutralise some of the yellow and give you a softer, more natural golden blonde result. You only need to leave the dye in as long as it takes to reach the colour you want, and you can use anything from a semi-permanent to permanent dye for this. The type of dye used will determine how long it lasts before fading becomes noticeable. If fading is a problem, a good blonde shampoo should keep it looking pristine without having to go to any extra effort to tone it regularly. So I have a question. My roots are a very dark brown and mu ends are a golden blonde. I am ultimately aiming for a honey blonde color. Basically, how do I go about bleaching/dying my hair without it pulling orange or golden as it has the tendency to do so! Use medium ash brown with 30 vol developer. I'd recommend Wella Koleston, Matrix SoColor, or Igora Royal. Keep in mind that black hair can be hard to lighten and pre-lightening with bleach is sometimes a more reliable method depending on how resistant your own hair is. I want medium brown but I don't want to bleach so should I get a light brown or ash blond for my hair what kind and brand do u suggest palete revlon or L'Oréal ?? You need to use brown dye for a brown result, not blonde dye. Blonde dye doesn't contain enough colour to tone your hair as it lightens. Would you prefer a medium brown or light brown? My hair is curly and thin its very dark brown .I haven't died it before.so if I use a blonde dye will it change my hair to brown and will it really damage it .what brand and shade should I use ?? The percentage means he's adding peroxide developer to it. If you heard 12% or 40 vol, it's very likely high lift is involved because that strength isn't generally used for anything else. Otherwise, it's definitely bleach of some kind. The purple colour would indicate Wella Magma, although there are a handful of purple developers available that when mixed with bleach would give a purple colour. Neither bleach nor high lift is generally foamy, but it's possible he added shampoo to it. Shampoo would cause the foam and is used in combination with mixed bleach to create a bleach bath. In any case, it has to be either high lift or bleach because there's nothing else available. When you really break it down to its most basic form, the lightening produced from either product is a result of the hydrogen peroxide content. The main difference is that high lift deposits colour and contains conditioning agents, whilst bleach doesn't. Bleach also contains ingredients like persulfates which actually break down into hydrogen peroxide, so the concentration of actual oxidant in bleach is higher than high lift because the peroxide content is higher. Based on this, and the fact that a high lift dye probably isn't strong enough for use on your hair if you are indeed getting platinum results from it, it has to be bleach. Whether it is a bleach bath, wella magma, or he's mixing the bleach with something else entirely...it's hard to tell. Bleach isn't actually all that damaging if used properly. Hair that is bleached once and isn't dyed excessively, permed, or had been previously coloured, usually won't show any signs of damage. It's only when it's used incorrectly or on over-processed hair that it causes significant damage. As an alternative, you could always try a high lift first. I'd recommend Igora Royal 12.11, mixed with 40 vol developer. Add 25% E-0 lightening booster, and a dash of 0-99 violet concentrate for extra lightening and toning power applied to roots. If you try a strand test with this and it takes your hair to platinum, you could use a high lift. If it doesn't, you have to use bleach. It would also rule out high lift dye as your hairdresser's tool because this formula is pretty much the strongest non-bleach lightener possible. If it doesn't lift as much, he had to have been using bleach. What an interesting mystery. Definitely not a high lift. Even the best high lift dyes combined with booster can't lift out that much pigment. If your hair really is dark brown, and it's being lifted to platinum (near white), it'd be very unlikely that a high lift dye was responsible. It sounds like he was using Wella Magma, which is a pigmented bleach that lightens and tones in one step. It's still bleach, but the package and the way it's marketed and used could confuse someone into believing it's not. Apart from that, the hairdressing industry is constantly moving away from the word 'bleach'. Everything is 'powder lightener' or 'cream lightener' these days. Manufacturers themselves often name bleach like this to try to hide the fact that it's actually bleach because bleach has a bad reputation. It's very possible that either your hairdresser was using bleach but genuinely thought it was some other kind of lightening product, or was using bleach but simply didn't want you to know that. If you can remember anything about the product, that would help me identify it. Eg, whether it has a particular colour; if it's a powder or cream; if it's scooped out of a tub or squeezed out of a tube. Which brand and shade are you using, and what volume of developer?